One Shot is a heavy duty environmentally formulated pressure washing chemical for removal of grease, heavy soils, dirt, carbon soot and all stubborn soils. 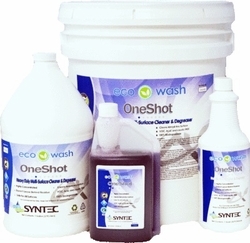 One Shot works on all surfaces from painted walls to masonry, brick, ceramic tile and stainless steel. Just spray and wipe some One Shot to easily remove all soils! For All cleaning, One Shot should always be diluted with water. Contains no butyls, acids, caustic alkaline, petroleum hydrocarbons, phosphates, or amines. This versatile product can be applied manually or through a high pressure applicator. � Super concentrated formula is easy to use and dilute. � Environmentally formulated to meet all �green� standards. � Contains special penetrating agents for the removal of heavy soils. � Removes grease, heavy soils, dirt, ink and all stubborn stains. � Can handle the toughest cleaning and degreasing jobs. � Highly versatile in usage and dilutions. � Can be applied through sprayers, by hand, or through pressure machines. Directions For Use: Before using, make sure that the desired surface is cool to prevent early evaporation. Read MSDS and test in a small inconspicuous area. ALWAYS Pre-dilute this super concentrated cleaning solution 1 gallon makes 5 gallons.